In most of the country it is colder than in summer – particularly early morning and evening. Which means you can hike during the heat of the day (and sleep in a little later). 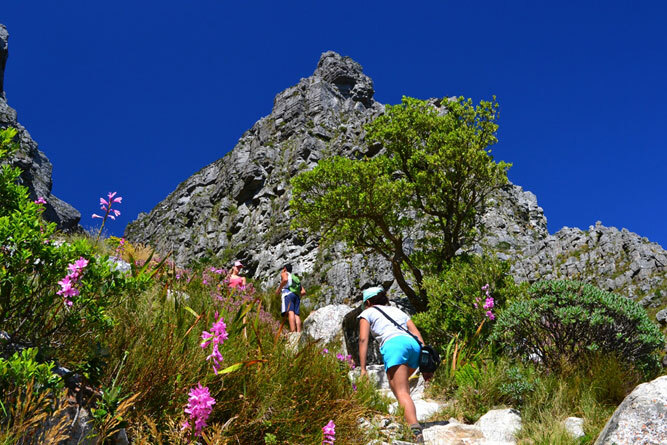 What’s more, there are heavenly blue sky days in winter – even in the Western Cape (although you’ll note that none of the recommended hikes are from there; we don’t want you complaining about rain now, do we?). Winter is the country’s secret season for hiking! 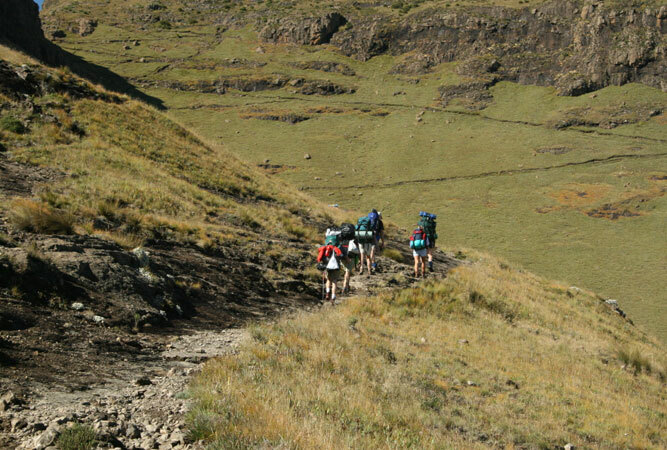 This fairly new, self-guided 3-5 day hiking trail is in the magic Skurweberge, between Badplaas and Machadodorp. These same trails form the Num-Num Running Trail, the country’s toughest single day trail run – now in its third year – through Highveld Escarpment terrain and extraordinary forest scenery. The trail has been developed by three farm owners around Badplaas and by all accounts it is both beautiful and well planned. The days are not long, which allows one to enjoy the magnificent scenery and the chance to stop at pools en route. There is also a slackpacking option, and shorter trails for those who don’t want to hike for the full five days. Expect escarpment, gorges, kloofs, forests, sandstone labyrinths, open grasslands, and waterfalls. Four days and three nights across 42 km, this back-pack trail leaves the Olifants Camp in the Kruger National Park on Wednesdays and Sundays from April through October. Sounds like a walk in the park but it isn’t, because you need to carry all your own gear, including your gas stove, tent and sleeping bag – there are no overnight huts on this hike and you’ll be pitching your tent wherever the trail leader chooses every evening. The hike is unbeatable when it comes to experiencing the true essence of Kruger, its wildlife, scenery and vegetation. It follows the Olifants River most of the way, in and out of gullies that fairly take your breath away – both metaphorically and literally. Make sure you take only what you need and that your backpack weighs only a quarter of your body weight. The first Green Flag accredited hiking trail in the Karoo, this hike traverses a pretty unique landscape with squat mountains and plains that stretch from here to the horizon. Add the unexpected, etched and rugged valleys, and kloofs with hidden pools and you experience the true Karoo. The Karoo Erdvark Trail lies roughly 80km from Beaufort West in the Northern Cape‘s Nuweland Mountains across a couple of working sheep farms – Rooiheuwel and Boplaas. This part of the country can be too hot for some during summer, but perfect in winter. The network of paths laid out for the hike vary in length and difficulty and there are options for more experienced hikers, and those after a more leisurely experience. Set around the town of Sabie, the Fanie Botha trail offers a number of options for hikers, depending on your level of fitness. In its entirety it will take you five days and incorporate incredible scenery – Mac Mac Pools, Mount Moodie and Lone Creek Falls, and a bird life that is worth the slog alone as you pass through forest, gorges and across grassy fields. There are six different hiking huts and three different starting points. Around these you can design your own two, three, four or five night option. 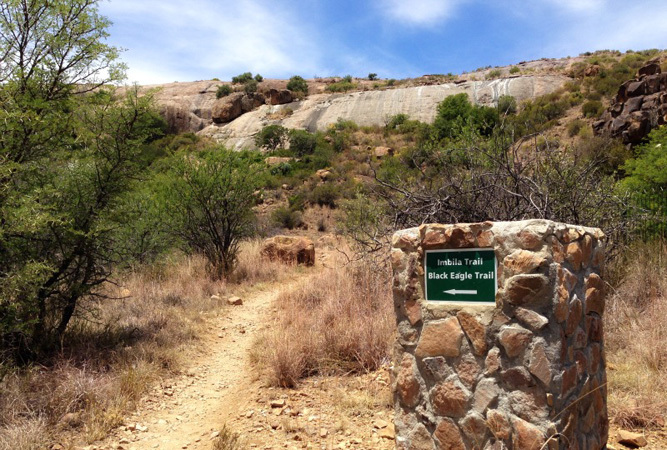 The hike was originally established as part of a wider network of trails stretching from the Soutpansberg all the way down the eastern escarpment to the Cape – known as the National Hiking Way System. Formerly known as the Bateleur Nature Reserve, the now Kroonvlei Wilderness Estate plays host to a series of hiking trails that you can easily do in a weekend. The bonus is that they’re really close to either Johannesburg or Pretoria Accommodation, and that Kroonvlei lies within the UNESCO Waterberg Biosphere Reserve. 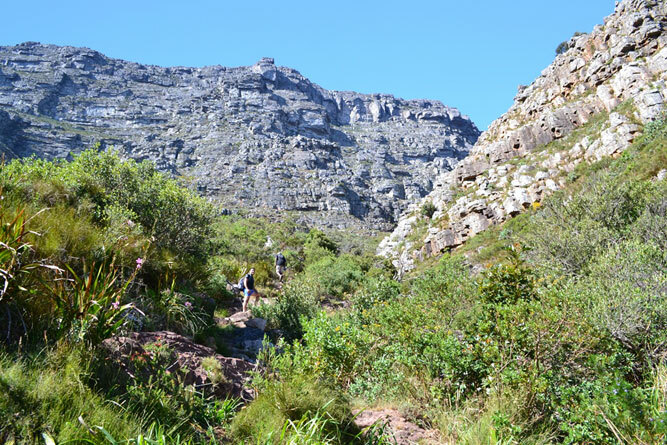 The two-day backpacking trails – formed by combining two trails (Kloof and Zebra, or Leopard and Porcupine) remain a firm favourite but there are also four shorter day trails. Called Stamvrug (stem fruit) after a common fruit of the area, and one of the base camps at Kroonvlei, the walks head through a number of incredible kloofs. You might catch sight of game too – giraffe, zebra, wildebees, kudu. The stars studded night skies make overnights essential. Thanks for these – we are contemplating a walking safari in Kruger – this post will come in handy.